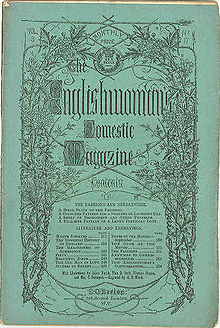 The Englishwoman’s Domestic Magazine was a pioneering women’s serial founded and published by Samuel Orchart Beeeton (1830-1877), husband of the writer Mrs Beeton (Isabela Mary Beeton). Aimed at the new middle classes, it is valuable source on the arrangement of the mid-nineteenth century household and its equipment. The magazine is also useful as a source on Victorian fashion and consumer attitudes.